Samoa’s first matches at the 2019 Victor Oceania Badminton Championships in Melbourne, Australia get under way today. 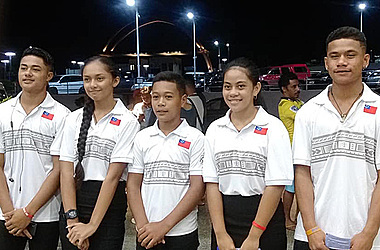 Ten Samoan athletes will compete in the Open and Junior Individual Championships from 11-14 February, followed by the Mixed Team Championships beginning on the 15th. In the Junior (U19) Men’s Singles, Chris Peti will play Australian Milain Lohith Ranasinghe, while Samoan Boys’ champion Charles Iamanu Faalogoifo takes on Australian Ryan Venpin. They’ll team up for a Doubles match against Tonga’s Siosaia Tei Fonua and Taniela Ngaue. In the Junior Women’s Singles, Faafofoga Reti will play Australian Margaret Zhao, while Samoan girls’ champion Jasmine Reti is playing New Caledonian Marine Naveros. They’ll take on Hinahere Mara and Meiissa Mi You of French Polynesia in the Doubles. Charles and Jasmine will play Tonga’s Taniela Ngaue and Lata ‘Isitolo in the Mixed Doubles, with Chris and Faafofoga taking on Australia’s Austin Chen and Guam’s Grace Cai. In the Men’s Singles, Aukuso Samuelu Sue will play Australian Kai Chen Teoh, national runner-up Hilton So’o will play Australian Anthony Wong, national champion Tupu Fua will play Australian Ying Xiang Lin, and Kennedy Simanu will play Australian Vincent Nguyen. In the Doubles, Fua and So’o will play Glenn Gowet and Ryan Nagle of New Caledonia, while Aukuso and Simanu will play Australia’s Keith and Tristan Edison. In the Women’s Singles, national champion Lizzie Caffarelli will play Australia’s Claudia Lam, and Folole Ioane will play Australian Yingzi Jiang. They’ll play Australian pair Jessica Lim and Talia Saunders in the Doubles. Caffarelli will pair with Hilton So’o in the Mixed Doubles against New Zealanders Dacmen Vong and Justine Villegas, while Folole Ioane and Tupu Fua will play Australians Boris Ma and Jennifer Tam.